I couldn't resist posting this picture..I took it about 3 weeks ago whilst on a school trip. I carried my enormous D50 around all day, which was some feat trying to control 30 small, excitable children - clip boards and all! I did use it to take some lovely photos of the children to make a display back at school but I also managed to sneak in a few of my own! Like this..I just have a thing about gates. 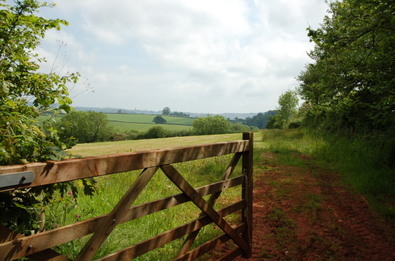 What you can see in the distance is Torquay and can you notice the red of the soil? This area is renown for its red sand/soil...but I don't like it - it makes the sheep orange! Anyway, regardless of red soil or sand, I was so pleased the other day. 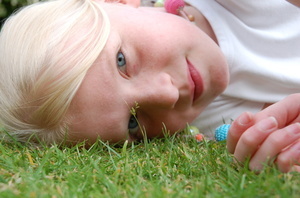 I happened to glance out of the window and saw Alice lying on the grass. Great. I have always tried to insist that my children should spend a part of their day, however small, lying on their backs gazing up at the sky. I used to love doing that as a child (& bigger girl!) and would try to imagine I was falling into the big blueness or studying the clouds. I looked closer. There she was not on her back but on her side with my beloved camera infront of her face! Well, I couldn't really be annoyed that she was using it..after I saw this lovely self-portrait!